The city of Fang on the Kok river is home to the notorious Trial of Champions. Once a year, adventurers and heroes enter Baron Sukumvit's Deathtrap Dungeon competing for the 25,000gp prize, none have ever emerged again. This year, you hope, will be different for you have entered the challenge! As a contestant you are treated like a king; spending your nights in a magnificent apartment, fed with the best of foods and wines you spend the night before the Trial in luxury. But even such comforts don't prevent your dreams being filled with images of flaming pits and huge, monstrous spiders. The night before the Trial’s opening ceremony, you go to a local tavern just to get a drink after dinner. There you meet a handful of other adventurers in Fang for the Trial. Collectively, you are Delario Al'Sid, a young Eloysian man, Ka' Thunq, a half-elf monk, and Lo-wang, a Daroon opportunist. Acknowledging each-other, you all come together to share a drink. Your server introduces himself as Seven Onyx Walrus, and he’s a big bruiser of an Daroon. As you three begin to talk, someone suggests that perhaps the reason nobody has ever emerged victoriously from the Trial of Champions is that none have thought to, or been willing to, join together with others to form a party. This thought led Delario to draw upon his training in law to draft an Agreement of Party Incorporation, but to really round out the group, you needed a fourth. As Fate would have it, your server, Walrus, has always dreamed of entering the Trial. This would be he year as he put his signature to the agreement, and the Murder Hobos Adventure party was formed. You are woken from your dreams at dawn by a trumpet call and minutes later there is a knock at your door. A man's voice rings out, "Your challenge begins soon. Please be ready to leave in 10 minutes". You quickly dress and check your equipment remembering the words of the Dungeon official last night at the briefing. 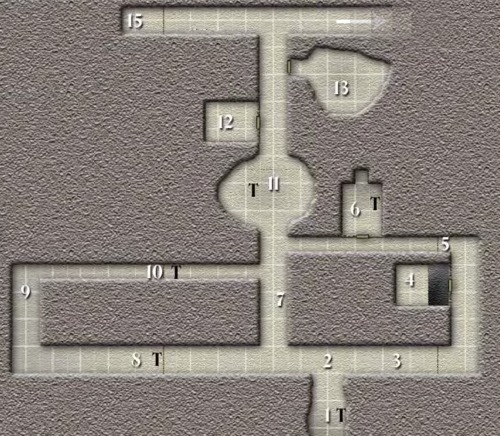 You are only allowed to take your own equipment into the dungeon but it is limited to: Any weapons and armour; magic items are permitted (but contestants are limited to four potions); food and drink is allowed; no sundry items such as a compass, rope or pitons, with the exception of an empty backpack, thieves’ tools and holy symbols are allowed to be taken into the Dungeon. The use of magic spells is also prohibited until you have entered the Dungeon. Leaving the apartment, you follow a guide through back alleys and narrow streets. You have to walk fast to keep up with him. Soon you come to a wide road lined with cheering crowds. Ahead you can see the dark mouth of a tunnel disappearing into the hillside with two huge stone pillars on either side. As you approach you can see Baron Sukumvit ready to greet the contenders in the Trial of Champions. Five other contestants are already waiting for the trials to begin: two Barbarians, a female Elf, a Knight in full plate armour and a Ninja warrior. A steward passes amongst you handing you all a single key. "A little aid", he says as he passes the key to you. "Now that you are all here" says Baron Sukumvit, "Let the Trials begin!" The Knight is first to enter the Dungeon, shortly followed by the Elf then one of the Barbarians, the Ninja, the other Barbarian and finally… you. The noise of the excited spectators gradually fades behind you as you venture deep into the gloom of the cavern tunnel. you will need to find and use several items if you wish to pass through my Deathtrap Dungeon successfully. of the floor reveals that four people have indeed passed this way, three turned west at the junction (the direction indicated by the arrow), the fourth turned right. The arrow points left. Three out of four of your predecessors went left. You decide to go left. You don't go far before reaching another junction. The corridor continues west, and a branch turns north. Not far north standing in the corridor facing north, his back to you, is a large humanoid wearing hide armour and carrying a club (7). When you call out to him to see if he is one of your rivals from the party ahead of you, he turns to look at you with a think, sloping brow that belays a primitive caveman. You don't think he even understands your words as he grunts and charges you. Surprisingly, the outcome is not as one-sided as you might have thought. Although you are able to dispatch you attacker, he give you some serious lumps, making you wish you had a healer in your party. As ghoulish as it might seem, you have very few resources, and will need every advantage to survive this dungeon, so you check to see what the caveman carried. Besides the leather armor, he was wearing a leather wristband with four rat skulls hanging from it. And his club. Not much of a haul. Delario decides to scout ahead down the western passage. About twenty-five feet down, hanging from the ceiling in the centre of the corridor he found a bell (8). A big brass bell. It made no sense. It would have been possible for him to scoot underneath or slide around against the wall, and he did make a search to see if there was some kind of trap, but then decided it's just not worth it - this bell seems to have no benefit, and is potentially some kind of trap. If necessary, they'll come back and deal with it later. Instead they head north. Not far past where you fought the caveman, the path branches again. First turning west again to your left, to the right a few feet ahead, and just after that it looks like the corridor opens up. Not wanting to get too far ahead of yourselves, you take the left passage heading west.